Arrayed across the page, the words evoke memories, pluck at threads of emotion as though determined to unravel their mystery. If you do not believe in the ginn, you have only to look at the heavens for proof. That “shooting star”, as you call it, what is it but the stone thrown by one of the angels in heaven when an evil ginn approaches too near in order to try to overhear the conversation of Paradise and thus learn the secrets of the future? Another custom is the way they mark one of those pauses in conversation which in England is sometimes denoted by the declaration that “an angel is passing”. After a moment of dead silence, one of the company will say, “Wahed dhu!” (“God is One”), and the whole company in a low murmur will repeat, “La ilah ilia Allah!” (“There is no God but one God”), and conversation will be resumed. I made a note of all the proverbs I heard in these talks, for all conversation in the East is enriched with unending proverbs, as with a wonderful power of expression in poetic form and idiom. Reading on in S.H. Leeder’s Veiled Mysteries of Egypt and the Religion of Islam, I realize I’ve encountered source material for Lawrence Durrell’s Alexandria Quartet. The diplomat Mountolive, whose name provides the title for the third volume of Durrell’s series, reflects on the customs of Egypt using remarkably similar language. Paragraph by paragraph, page by page, elements from Leeder’s work find their correspondence in the opening section of Mountolive. For the first time, I see laid bare the process of literary transformation, and smile. Beyond the sheer delight of surprising Durrell at his craft, I smiled as well at the presence, even in Islamic culture, of the so-called “silent pause”. Western literary examples abound, as in this bit of dialog from August Strindberg’s 1879 novel, The Red Room. “An angel is passing through the room,” said Agnes. “You!” said Rehnhjelm, respectfully and ardently kissing her hand. Only three years later, F. Marion Crawford described the nature of the experience in his novel, Mr. Isaacs: A Tale of Modern India. There are times when silence seems to be sacred, even unaccountably so. A feeling is in us that to speak would be almost a sacrilege, though we are unable to account in any way for the pause. While the French are willing to describe everything from bed and breakfasts to birds in flight as un ange passe, they also use the phrase to refer to sudden, unexpected breaks in conversation due to awkwardness or embarrassment. In all cases, the implied question remains: is the angel the cause or the effect of the silence? Some suggest an angel’s passage causes conversation to cease. Others prefer to believe that the angel is aware of human awkwardness or embarrassment and “passes over” in order to smooth things out. Even for those not inclined toward angelic explanations, the phenomenon is real. Some refer to any significant break in a conversations as the “Harvard Pause”. The phrase isn’t limited to academic settings but is used to describe all those sudden silences – sometimes awkward, occasionally discomfiting, always unexpected – that descend upon family gatherings, social occasions or boardroom discussions. The source of the phrase seems a bit of a mystery. In a 2006 forum discussion, the member known as jshelus described the phenomenon. You are at a party, everyone is talking in small groups. The din is notable, and people speak up to talk over it. About every 20 minutes… the din drops dramatically for about 30 seconds to the point where it is noticed by everyone, Then, it picks up again. We both remember being told about the phenomenon as something that was studied by a Harvard professor and [thus became known as] the “Harvard Pause”. Another forum member suggested the phenomenon had been explored in one of Jay Ingram’s books. When a participant recalled being told that such silences mean Abraham Lincoln’s ghost has walked into a room, it reminded me of my grandmother’s response to conversational lulls at the dinner table. “Someone’s coming to visit,” she’d say, though whether she expected Lincoln, an angel or a neighbor from down the street is impossible to say. That someone would apologize for making reference to angels is at least as interesting as the expression itself. If the forum thread still were open, I might suggest the Harvard Pause had to be invented because there aren’t any angels at Harvard to soothe those uncomfortable silences. Then again – because humor of any sort is difficult on the internet – I might not. Whatever the truth about Harvard angels, we stand at the brink of a season when pauses of any sort are rare. This is The Clamorous Season, a time when Christians complain about retail pressure and commercialization while non-Christians grump about bombardment with Christmas carols and demands for public mangers. Still, whether we’re lighting Menorahs or seeking the Star of Bethlehem, awaiting the Solstice or breaking the darkness with bonfires, there’s much to enjoy in the social occasions, the decorating, the gift-giving-and-receiving . The chatter of children, the cacophonies of shoppers, the chants, cadenzas and choruses of song – these are the sounds of celebration, the means of our rejoicing. And if silence should descend upon our celebrations like a pall, leaving us awkward and embarassed, if we should find ourselves speechless and tongue-tied, silenced for no apparent reason, perhaps we would do well not to seek to fill that silence too quickly. We are, after all, in the season of waiting and sacred silence which some call Advent. When the unexpected silence comes, as it always does, and when we are tempted, as we always are, to break that silence with our chatter, Advent counsels restraint. Despite the clamor, this also is a season of angels – messengers to humanity of a deeper, richer reality than most dare imagine. In the heart of every unexpected silence, if we pause to listen, perhaps we shall hear for ourselves at last un ange passe – an angel passing by. No matter what you are doing, spin threads for heaven! Comments always are welcome. To leave a comment or respond, just click below. Please, no reblogging. Thank you. I LOVE this. I think I shall print it out. In this season of excess, silence is the one thing we need to have more of. Here I have to agree with Scrooge: “Keep Christmas in your own way and let me keep it in mine.” I prefer the silence of a winter night sky. My goodness. I’m honored. I’m glad you found it of worth. That’s what Scrooge said, too. “I want to be left alone”. But in the end, he wasn’t alone. Garbo and Scrooge – what a pair. I’m with you on those winter night skies. Christmas in the country is the best. You know what else? I’m going to keep my mouth shut more often so I can hear the angels more often and they can hear me. Nothing wrong with that. I’ve always been tickled by that country expression, “Well, shut my mouth”. As the husband of a woman who likes to say that once responded, “Yeh, well, if you did, we’d all be better off”. They just grinned at each other. Fascinating history. Thank you for sharing! Thank you, so much. The Durrell/Leeder connection arrived as pure serendipity, and is so much closer than even this post indicates. It is a fascinating history, indeed. Best wishes to you – I’m so glad you stopped by, and I appreciate your kind comment. You know, I’ve never heard that expression before when a sudden silence descends — interesting. Advent is challenging for some, with its goal of waiting. Society urges us to go for it while religion stresses patience. As for angels, oh, yes, I’m definitely a believer! And if those lulls in conversation mean an angel is near, then perhaps we need more lulls because we sure need the angels’ guidance! I never heard about angels passing until I went overseas. Grandma would say “Someone’s coming to visit”, every time we’d have one of those pauses, but it was French-speakers whom I first heard using “un ange passe”. The decible level certainly is going up. When I realized that part of what makes my work so enjoyable is the silence, I decided to see what I could do to bring a bit of quiet to the rest of my life. Dumping the television was a very good start. I understand that I miss some fine programming here and there, but if something is highly recommended, it’s usually available on the internet. The truth is, we have more control over our lives than we sometimes realize. I’ve been thinking about Domer tonight, a lot. I think part of what makes him so remarkable is his ability – and willingness – to control his own life. Even from this distance, it’s pretty clear to see that, even though bad things may happen in his life, he’s not going to be the one causing them. I do love Advent. It can be a little strange, “keeping Advent” in the midst of the pre-Christmas chaos, but I think there’s some value to it. In fact, I think there’s a good bit of value. Linda, I so appreciate your kind words about Domer. In so many ways, he’s been a true blessing to me — he’s got an amazingly strong inner core, one that’s deeply religious. I’ve always been proud of how big his heart is, how willing he is to help others without going along with the crowd. I think when we realize how much we’ve been given, and how little we deserve, we’ll be better able to keep the spirit of Advent. Even as children, we find it so hard to wait. We’re “almost seven,” not merely six and a month or so! But children can and should be taught the importance of waiting. You’ve brought back memories of how hard it was for me as a young child to wait for Christmas – and a lesson or two I learned about the importance of waiting in the process of growing up. “Thou Shalt Not Snoop” ought to have been the p.s. on Moses’ tablets. Very, very interesting Advent entry. I sure wish that more Angels descended in my life with lots of sudden silences. I do know one thing, I have collected Angels figurines for over 50 years. Each Christmas season they come out one by one and as I pause to look at them, I do feel a sense of peace. There have been times in my life when I have felt the presence of guardian Angels who have saved me from imminent dangerous situations. Those are the moments when silence reigns as the heart and mind are trying to find an explanation for their ‘unseen presence’. I had totally forgotten “The Alexandria Quartet” by Lawrence Durell. I read the books a very long time ago…. I may add the four books to my Christmas wish list! You tell a timely and interesting tale ! I remember your posts about your presepe. I suspect some of your angels are part of that display, and I know you treasure them all. I have a pair of very plain ceramic angels that belonged to the grandmother I mentioned in this post. Each year they’re given a place of honor, and each hurricane season they’re included in the “go bag” – that collection of mementos that can’t be left behind. I did have to make a visit to Uncle Google to be sure of the spelling of “presepe”. Oh, my, did I laugh. There’s one dotcom site selling pieces that calls itself “Figure Landi” – a little Anglicization to go with your angels. My view of angels changed somewhat when I learned that, Biblically-speaking, they’re messengers. Our cutesy cherubs and sweet-faced young ladies with feathers have their place, but I suspect they’re not up to all angelic tasks. I still think of the mysterious person who stopped to call the EMTs and police after my terrible accident so many years ago as an angel – even though he was quite earthly, and I had the chance to meet him afterwards. And who’s to say who’s around when we hear those voices saying, “Don’t DO that!”? There are mysteries in this world, for sure. I think the Quartet would be a perfect addition to your wish list. It’s one of those works I’ve re-read multiple times. Now, I think it’s time for another reading – with some other references at hand. I love the idea of the angels! There have been times I’ve thought to myself, “I swear J and her family have a whole fleet of guardian angels working on their behalf!” There are any number of ways to explain some of the events you’ve described for us, but “angels” works as well as any other! First of all, Linda, what a beautiful image that is of the person walking past the angels. I presume it’s your own photography, and I commend you on your capture of the moment. I really like that idea of shooting stars and angels, and so much so, that I’m prepared to forgo scientific explanations of the phenomenen! A lovely music video, too. I really don’t like using captions with my blog photos, so I make it possible for information to be found by “mousing over” the image. If you do that, you’ll see that the photos in this entry aren’t mine – all of the information is available through the mouseover, and you can click to be taken to the original page. As I noted, the first photo’s been cropped a bit to save detail. If you take a look at the linked original, you’ll see it’s even more splendid. I especially like the unusual – and unexpected – contrast. The angels are stationary, while all of the movement belongs to the man. The association of angels with shooting stars is the same sort of folkloric construction as saying “God is moving his furniture” when it thunders. Grandma used to say it was the Devil, beating his wife. Even the Greeks and Romans had their little sayings – some of which were pretty earthy, but fun. I’m glad you enjoyed the post – and the music. I’ve been enjoying the video for more than two years, waiting for a place to include it. Thanks for reminding me of “The Alexandria Quartet” I last read it in college and my copies of the books have wandered off somewhere. It’s on Kindle. Just reordered. The books are a tour de force of “source bias” — how events are filtered through the persons that experience them or relate them. It seems nobody knows how to be quiet anymore. We’re beset by noise everywhere. It’s to the point where silence makes people nervous to the point that they have difficulty tolerating it and seek to fill it up with noise — the radio or the TV playing constantly in the background. (People don’t know how to be solitary anymore, either.) I had forgotten the expression about an angel passing. It is not in our local repertoire of sayings. The Christmas carol is delightful. When I first read “The Alexandria Quartet”, I didn’t so much read it as just fall into it. In fact, because of difficulties involved in obtaining the individual volumes (I was overseas and Amazon hadn’t been invented) I didn’t read them in order. Finally, I had the entire set and started from the beginning. Since I’ve begun writing, my admiration for the work has grown, and it was only in the past year that I finally found the marvelous joke linking the beginning of Justine and the ending of Clea. They’re asking for book discussion recommendations for 2014 down at the library – I may add Durrell to the mix. Solitude and silence do go together – except when the tv and radio are involved. Well, or iGadgets, I suppose. Intuitively, I recognized when I began this blog that my work environment was going to be one of my best tools. Working alone, having the opportunity to remain in silence if I chose, gave me plenty of time for reflection. I love the carol. I linked the English translation separately because, to be frank, understanding the words isn’t necessary to appreciate the video. There’s so much symbolism woven through it. I imagine some reflects Orthodox traditions – the bread, the oranges, the lilies. Glad you enjoyed it. It is 5:30am on the first Sunday of Advent – you made it! What a wonderful array of thoughts you present. Angels, shooting stars, anticipation, tradition and silence, which to me is ‘golden’. I have a feeling Leeder must have come from a different part of England than I, as I have never heard the phrase, ‘an angel passing’. A group of rugged Yorkshire farmers often had ‘silences’ in their conversation, which would be broken by one uttering ‘Oh, aye’, as though someone had said something and he was answering. I heard it many times when I eavesdropped on my granddad and his cronies, as they sat around the kitchen table discussing farming issues or poor weather situations. As a child, whenever mum and I looked up at the bright starry night sky, she would say, ‘make a wish’. Looking out last night at the mighty constellation of Orion, which seemed to fill the sky from my bedroom window, I suddenly remembered her saying, ‘make a wish’….so I did. It may be the first Sunday of Advent, but it is also the first of the month, so my wish for you is a happy month of anticipation, waiting and the eventual ‘arrival’. It is the first of the month – I’ll see if I can find some angelic white rabbits for you! I wondered if you’d find the phrase “angels passing” familiar. My friend from Staffordshire hadn’t heard it either, but like you, she remembers there was a phrase often used to fill those awkward silences. She can’t remember exactly what it was – but she’s working on it. I like the assent to the unspoken words. I do have a feeling those silences were less unexpected and awkward than simply companionable. I know you’ve been around long-married couples who barely say a word – they’ve had the same conversations for so many years, they truly do know what the other is thinking. I suspect those farmers, though silent, knew where the others’ thoughts were winding. You got to wish on just any star? Lucky you! We had to wait until we saw a shooting star, and believe me – there were many childhood nights spent staring out the window when I was supposed to be sleeping! Lucky you for having Orion, too. It’s my favorite constellation, but it stays relatively low in the sky here. At least it’s visible now, when I can get away from the soft glow of the petrochemical industry. Thanks for stopping by – I’m eager to see what you have for us today. I didn’t have to wait for comets, either. Just that first star. Yep, we did that too. We wished on white horses, and if two people said the same thing at the same time, you could hook little fingers and make a wish – as long as no one said another word before you did! My goodness. Wonders never cease. I’ve not heard of angels passing and in fact I had to think really hard to conjure some moments of silence during various conversations. I am not a social person so I’ve not been in that many groups of talkers. I enjoyed this post a great deal. I always learn something new from each of your posts. A great teacher, you are, Linda. I used to be in larger groups more often than I am now, and I’ve been in some situations where “making conversation” is just what that phrase implies – something that requires effort. When someone says “the wrong thing” or suddenly no one has anything more to say, it would be handy to have some commonly-agreed-on way to move things along – like saying, “An angel is passing”. The whole issue may soon become moot, of course. The last time I was in a restaurant, I was amazed to see the number of tables where no one was talking to anyone else. They all were staring at their iGadgets. I really don’t get it. If you’re only going to stare at a screen, why not stay home and eat leftovers? Ah, well – I’m clearly out of step on that one. I’m glad you enjoyed the post. I learned a lot from this one, too. In fact, I have a feeling there’s more to learn. This is interesting, and I shall try not to speak to cover the silence. It usually gets me in trouble anyway. Of course I thought about you when I was writing this one, especially after reading your post. All I could think was, there is a time to speak, and a time to keep silent. We usually can figure it out, if we don’t let other people push us one way or another. One voice I did hear speaking very early this morning was Jason, from the seafood joint down on the Texas City Dike. Fresh, local oysters and picked crab are available. I believe I’ll make a trip later this morning. Yes, do get some good, fresh seafood. We fried two pints of oysters last night (my diet is shot till January). My brother insisted that we take a few pints home at Thanksgiving. As always, a wonderful and interesting post, Linda. Really interesting to see a bit behind the genesis of Durrell’s sumptuous work that I have admired for many years. Thanks for revealing it to us. Here’s another little tidbit that may amuse you. I dug around in my correspondence and actually surfaced the email where I first mentioned writing a post about the phrase “angels passing”. It was November, 2008. Apparently some things need to percolate longer than others. What’s most interesting is that I didn’t come across the Leeder material until two weeks ago. If I’d written about “angels passing” in 2008, I probably never would have found the Leeder, nor the use of his material by Durrell. I can guarantee you that relationship is far more interesting than whatever I had in mind five years ago. At this point, I don’t even know what the point was to have been. Happy to have added to your Durrell knowledge! The magic time of Christmas is slowly creeping in bringing the peace and joy we need so much. Angels are perfect to entice the upcoming holidays. Several years ago I heard the expression, “Like an angel passing through my room.” It was a delicate song brilliantly performed by Sissel Kyrkjebo. Your wonderful blog post reminded me of Sissel and her angelical song. Please clink this link to make a brief pause and listen to an angel passing through the room. I like your image of Christmas “slowly creeping” toward us. It’s such a nice contrast to the pell-mell rush that so many hold a vested interest in promoting. I’d not heard the song, and I’d not heard of Sissel Kyrkjebo. I do know ABBA, however! It’s interesting that this was the only song Björn and Benny wrote for a single voice. Not only that, my hunch is that both the title and the song are based in a folk saying about angels passing. August Strindberg, who used the phrase in “The Red Room”, was himself Swedish, and other Swedish writers have used the phrase, so it makes sense that a Swedish pop group might pick up on it. Thanks for sharing the song. It’s beautiful. I have never heard this expression but I will remember it always. It’s beautiful to think angels are just passing by now and then. No agenda — or maybe there is one. But just passing through. As always, Linda, this is so beautifully written. I send you wishes for visits from lots of angels, pretty lights, silences when needed and joy always. It’s the season for angels and lights, silence and joy. I’m so glad you have your health again, so you can enjoy it properly. I can’t wait to see what you get up to, now that you’re free to “give it your all”! You’ve done an excellent job in tracking down so many instances of the silence~angel belief, which I confess I’d never heard of. The closest in my experience is the classic film It’s a Wondeful Life, in which children are told that every time a bell rings an angel gets his wings. Since this was a blog entry and not a scholarly article, I had to limit things a bit. However, I did take a screenshot from page 29 of the folklore study that highlights some examples from Spanish literature. The book, by the way, is “International Folkloristics: Classic Contributions by the Founders of Folklore”, edited by Alan Dundes. “It’s a Wonderful Life” is a wonderful film. And my, didn’t we believe it. We’d run around the house shaking straps of sleigh bells, trying to get wings on all those angels! I like that sarcastic footnote, which I think of as physics applied to folklore. There’s nothing like a reality check, is there? Exactly. The footnote also evokes for me an image of angels perched along a wire, preening their feathers. I’d love to see that as a print, particularly if they were interspersed with blackbirds. What a lovely Advent post, Linda. Whether it was your inspired writing or an angel passing, by the time I finished reading it, I felt a sense of calmness and serenity. I am glad to know that I’m not the only one that hadn’t heard the phrase, “An angel is passing,” whenever there was a pause in conversation. “Awkward silence,’ yes, but nothing about angels. As a new returnee to the Land of the Hearing, I’m finding that there seems to be more noise than welcome sound. Was the world always this loud and discordant? I don’t recall it so. It is distracting, uncomfortable, yea, even painful at times. I sometimes find myself longing for my old world of silence, yet I desperately want to fling off the isolation that world bestows. While I’ll not go back to the silence that was, I will treasure the periods of silence and contemplation that will come. I’ve thought so many times about the similarities between newly-sighted and newly-hearing people as I’ve followed you through your journey. In Annie Dillard’s “Pilgrim at Tinker Creek”, the chapter titled “Seeing” includes some fascinating studies and stories of the newly-sighted. If that’s not analogous to you learning to sort out sounds, I don’t know what would be. There are even some stories of people so overwhelmed by their new sight, they refuse to use it. If you can find the book at the library, I think you’d enjoy the whole thing, but that chapter, particularly. It’s a noisy world, for sure. And it is much louder and discordant than it used to be. I think that’s one reason that the virtues of solitude and silence are being written about so often. Even if we can’t move to the country, we can find ways to reduce the racket. Thanks so much for this invitation into silence. I don’t preach much these days, but when I do I invite the congregation into a “moment of silence” after the sermon. I have learned that I have to insist upon announcing the hymn after the sermon because musicians (in the main, but not all) seem very uncomfortable with silence and might give us 10 seconds or so! I will admit, it takes some getting used to, but I am increasingly enjoying intentional silence. As for “an angel is passing” I didn’t know of this, and so am grateful for a new learning in this Advent season. Recently, I’ve found myself pondering the similarities between clutter and noise. If my external environment is cluttered – as it tends to be from time to time – I often find my mind unfocused and easily distracted. Silly as it may sound, I think more clearly and write more easily if the dishes are done and the magazines picked up. In the same way, there seems to be a correspondence between external silence and internal silence.The more I allow external “noise” to overwhelm me, the less content – and focused – I become. Of course one person’s “noise” is another’s serenade, so there’s that. Still, a quieter external world does seem linked to internal realities in some very interesting ways. A few comments down, I just saw that Susan has sent us off in a wholly other direction with her reference to Elijah and Passover. The German phrasing – that an angel is passing over the house – surely recalls the events of Passover. It would be interesting to explore a bit more, to see if there are Old Testament roots for some of these expressions. In any event – a blessed Advent to you. I’m with you. A clean desk makes for a productive morning. As you note, this is a preference rather than a rule but still, there is something mystical about quiet. We were on a pilgrimage in Norway this summer, and I found that long moments of hearing nothing increased my ability to hear and listen when a something sounded, whether externally or not. I like the image of shooting stars, comets, and angels. Especially after the intense scrutiny of comet ISON in the recent days. That scene has become pretty quiet, but not forgotten. Melanie and I had a busy week. We had several visitor and a dinner, as did many. This morning we all met for breakfast at a local place. Afterward, the two cars of visitors left in opposite directions down the same hwy. We went home. As we sat at the table doing some tasks and checking the web, we commented how quiet it was…how nice it was to hear the quiet. Thanks for your thoughtful post. I had heard that expression once before many years ago. I just watched the latest video over on SpaceWeather.com. ISON certainly provoked a good bit of excitement before beginning to fade. Holidays, family and traveling can get a little chaotic. In a good way, for most of us. But if your family’s like mine, there always was that sense that “We Only Have Three Days Together”, and everyone wanted to make the most of it. We’d eat too much, stay up too late, talk over each other and occasionally bring up “those” topics. Then like your visitors, everyone would scatter, and the silence would be – nice. It tickles me that you actually have heard the expression. It seems to have been more common in Europe, with other phrases used here. But it’s a lovely way to mark a common human experience with a kind of poetry that pushes back the boundaries a bit. Nothing wrong with that. The Christmas season is so beautiful. It’s the perfect time to think about angels, and all the beautiful things they do for us. I hope your season is beautiful, and that your angel keeps close watch over you! Silence is golden. Weighty post needed these days. It’s gotten too loud – so harsh. It does tear the soul, jumble the nerves and attribute to the rudeness/thoughtlessness of living. I miss being “in town” close to neighborhoods where we grew up and feel at home – and all the museums and events – but the noise level there is so bad, I’m always ready to leave. I remember living in Bellaire when 610 was built and the continuous noise disturbed everyone – what would they think now? Maybe the angels are doing what they can to mitigate the emotional/mental/physical noise. Nice to think they would try. I spent Thanksgiving at a friend’s house in Bellaire. She’s still in one of the “little houses”, at the end of a street, next to the railroad tracks. She laughs and says it’s better than a cul-de-sac. There’s no through traffic, not much attention from the powers-that-be, and plenty of trees and birds to provide an almost-country feel. She can get to the library, the grocery store and her doctors without having to cross the loop or Bellaire – it’s a great situation. On the other hand, I wouldn’t move back into my old digs at Kirby and Westheimer. There’s too much traffic, too much crime, too much hipness. I still go into Houston for this or that, but I don’t think I’d enjoy living in Houston the way I used to. Of course, I first moved into the Medical Center in 1973 – what a difference forty years makes! 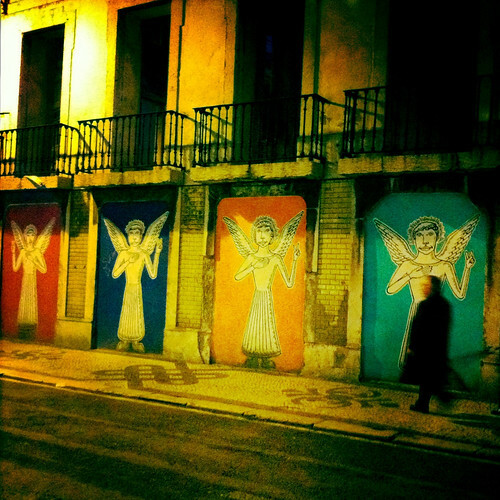 Angels as noise mitigation agents – there’s a creative thought. I was a little sad to see ISON fading away, but the good news is (1) the scientists still will be able to learn a good bit from it, and (2) there’s something else already coming down the line. We just don’t know what it is. Wouldn’t it be funny if instead of a comet, we get…. I have heard of a Harvard pause, but never “angels passing through the room.” I think I prefer the latter over the former though. This is such a quiet entry befitting the beginning of our Advent season. The things I enjoy about your site, are the quiet impact of your words, the cohesion of your reflection, and the sensitivity in thought in so many comments, yours and others. I enjoy coming here to block out and escape from things raucous or noisy, literally or figuratively. Thank you for capturing the stillness of Advent today. This did make me think of our reunion at my brother’s on Thursday. We arrived at noon and stayed until close to midnight. Goodness, with that much time together you might think there would be more than just a few lulls in the conversation. However, my brother had created a slide show on a flat screen on the wall of family photos, past and present including not only family members but places where we have traveled. He also, included old black and whites dating from the 1800’s (talk about angels passing through the room) and then some “random” photos of art he enjoys. I found myself visiting with family members and when I’d had enough, I enjoyed just viewing the photos quietly sometimes sitting next to a family member to comment, ask questions, laugh together or just oo ‘n ah. I am so grateful for his effort as I heard the younger ones comment and ask about so-and-so. There may have been lulls, but the visual thread was quietly present. I’m glad he didn’t have “music playing in the background” all the while. The house is very quiet now, and I hope as the younger ones return home, they’ll think about and remember some of the images on Uncle Rob’s wall. I did laugh when I read it. But it didn’t really fit here, because of the different meaning. It’s interesting, nonetheless. I’m glad you experienced the post as a little vessel filled with quietness. The need for silence – for reflection, for creative work, for a blessed relief from the blathering of the larger world – always is real, but this time of year, it seems especially important. It’s a human need, not just a Christian or Jewish or Buddhist need. Using words to capture silence seems like a paradox, but that’s what we’ve been given to work with. Of course, I’m pretty firmly rooted in concepts like “living word”, so that affects the way I approach things. Your Thanksgiving experience sounds wonderful. Your brother’s idea is so creative, and a wonderful gift to the family. More and more often I hear people expressing regret that they didn’t identify the people in the photos, ask the questions, seek out the stories when it still was possible. He moved your family along the road of remembrance rather nicely, and did it in a smart way – appealing to the younger ones. I suspect they’ll remember this Thanksgiving longer than usual. And your comment put me in mind of the advice offered by Yogi Berra – “When you come to a fork in the road, take it”. How I could have missed the Passover implications of the German phrase particularly – “an angel is passing over the house” – I don’t know. I suppose it’s because I was trotting down one path, focusing on one thought. That’s good, in that I try in my posts to stick with my own rule that “purity of prose is to write one thing”. But I love all the wild and random thoughts bringing Elijah into the conversation evoked. As I mentioned to Allen, it would be interesting to explore the history of these sayings with an eye to Old Testament roots. And, lo! For the first time I enjoyed reading something about John Cage. I went over to the Wiki for 4’33”, and learned a good bit. Of course, sudden, unexpected and inexplicable silences are one thing, and quite different from his structured silences. Still, it’s an interesting connection, and a perfectly reasonable one, given the commenter, no? His foray into the utterly soundproofed room reminded me of my own trip to Stonehenge. I didn’t get to hear my neurons firing, but I did hear the sound of my blood making its appointed rounds. I rather prefer Stonehenge, and the surprises it brought. I’d not heard of this before either (Angels passing) although I do believe in angels. :-) Wish I was more aware of their presence than I am. Thank you for the gentle nudge as we enter the Advent season. These folks sayings are interesting – they take so many forms and often seem linked to specific cultures. But even where “angels passing” isn’t familiar as a phrase, the experience usually is. I suppose the trick, for us, is to look at the silences that appear “out of nowhere” as opportunities rather than problems. Oh, is that Serbian song gorgeous! I had never heard the phrase in any of the contexts you’ve detailed — education neglected, I suppose. And as for the Christmas season experience as a Christian, I find that I can easily block out most of the relentlessly commercial aspects. Being in a self-imposed media blackout does have its benefits. But it still takes effort to have those quiet moments for reflection, for marveling, for truly appreciating. It’s not only gorgeous, it seems to be a real favorite, and a standard of the Serbian equivalent of the Sunday School program. No bathrobes and tinsel halos there, but I suspect there are plenty of beaming parents. I’m not sure it’s a matter of education. The saying never showed up during my formal education, and since it wasn’t part of my family or neighborhood’s informal life, I never heard it. Now that I’ve found it, I intend to cherish it and spread its virtues far and wide. It is amazing how much can be blocked out, and so easily. It’s the old problem of knowledge vs. will. Every knows perfectly well how to turn out the more obnoxious aspects of the season. It’s just a matter of summoning the will to do so. Here’s to a season filled with those precious, quiet moments. Roomie loves that Serbian piece, she’s determined to learn to sing it phonetically and is demanding that I learn it too! My department had gathered for a birthday breakfast and everyone was chatting until a 30 second pause in the conversation. It was fun to be reminded of this post and count the moment as the passing of an angel. You can do it! I’m to the point where I can “hear” most of the words now. Only a couple of sounds give me trouble. I can’t quite figure out what they’re supposed to sound like. But it’s such a beautiful carol I’m equally determined to be able to sing along. I love that you’ve had that experience, so soon. And it delights me that you considered the angel as a possible explanation. Thanks for the inspiring post. That first Christmas came after 400 years of silence. And I’m sure those first nights in the manger were relatively quiet too. The most important message is delivered in a still, small voice. How we need peace and quiet, especially now. Your mention of the silence of the manger reminded me of that lovely video you posted – was it last year? – of Canadian artist William Kurelek’s rendering of the nativity. The musical accompaniment is perfect, and a reminder that peace and quiet sometimes can be heightened by sound. You mention of the “still, small voice” also reminds me of a wonderful quotation from Albert Einstein: “God is subtle, but not malicious”. If only we could fully grasp those words! Welcome to the quiet season – a perfect time to pull out “The Irrational Season” again. Yes, it’s that time of the year when I prepare a ‘Reading the Season’ post. It’s a good time to remind me to listen for that ‘still, small voice’. Glad you remember that Kurelek clip. We’re having blowing snow now and the temp. will dip to -32C later this week. Can you believe that!? A week to read and write. You have a wonderful week! Can you believe that, at work today, I had to change from corduroy and a sweatshirt to a cotton shirt and capris, or that by the mid-afternoon I was barefooted? But don’t worry – it isn’t going to last. The weather in your part of the world is heading this way, and I’ll have my shoes on again by the weekend. By Thursday, actually. It’s part of what makes our transitional seasons so – interesting. I’ll be eager to see what you choose. I read some selections from Flannery O’Connor’s “Prayer Journal” in “The New Yorker” and went in to order it today but found it’s out of stock in hardback. I may re-read “A Habit of Being”. Stay warm – I suspect no birding this week! Loved the carol, Linda. As for Angel’s passing, it is the first time I ever heard the phrase. I usually call a drop in conversation an awkward silence. The Alexandria Quartet was the first serious set of books I ever read. I was in high school at the time. There was a small bookstore in Placerville and the owner, an elderly man, had become something of a mentor to me. I picked up Justine one afternoon and asked if he would recommend it. You might say an angel flew through the room or maybe it was just an awkward silence. Like doesn’t begin to describe how I felt. The books absolutely transported me to another world. I can’t think of any books I have read since that have had the same impact. Last fall when I travelled through the Greek islands I carried a travel book that Durrell had written 40 or so years ago. He had spent several years on Corfu and that is where Justine started. I felt like I had reentered his world. My experience was the same, Curt. I came to Durrell in Sierra Leone. I was in Freetown on holiday, and in a fit of literary romanticism had made pilgrimage over to the City Hotel to sit on the verandah and read a bit of “The Heart of the Matter”. I started chatting with a fellow who suggested that, while Greene was just fine, I really needed to check out Durrell. I was staying with friends who happened to have a copy of “Balthazar”. I got started, and couldn’t stop. They were kind enough to let me carry the book back to Phebe, and that was the beginning. Eventually I had all four volumes, and started over, in order. I’ve always wondered if Durrell’s reprobate, Scobie, wasn’t drawn from Greene’s Scobie. I need to dig into that a bit. Your travel book wouldn’t be “Spirit of Place: Letters & Essays on Travel”, by any chance? I picked that up a few months ago for winter reading. I’ve dipped in here and there, including the section titled “Return to Corfu”. I suspect having the book with you in Greece would rank right up there with reading Graham Greene at the City Hotel. By the way – this year’s the 150th anniversary of Cavafy’s birth. We ought to throw him a party before the year’s out, don’t you think? I like it… writing as reordering and reworking reality. That’s what we try to accomplish– seek out that which is significant and trim out that which isn’t. What a wonderful, sweet writing! I too love the origin of angels-as-messengers… And long ago I learned of the phrase / theme of angels passing. I always think of it on my solitary hikes, where there’s MUCH needed silence. We definitely need more of it in today’s world. Look closely at those alligators – you never know which one might be an angel in disguise! Seriously – those hikes of yours, the time you spend in solitude in nature, has to be refreshing and nurturing. When I’m at work and hear a sudden osprey call, or the silly, gutteral chatter of the coots, I can’t help thinking how many people aren’t hearing those sounds, and what a loss it is. The old cautionary phrase we were taught when we were learning to cross streets by ourselves isn’t such a bad one for grownups: “Stop, look, and listen”. Maybe that’s what those angels are trying to tell us in the sudden silences. At an ever increasing frequency, as I grow older, I appreciate silence more and more. Perhaps angels do indeed have something to do with that. montucky, I think there are many reasons for our increasing appreciation of silence as we age. It’s something I’ve noticed, and so have many of my friends. Part of it is that I’m increasingly impatient with people who have nothing to say, but won’t stop talking. Music blaring in shops and restaurants doesn’t put me in a festive mood, it makes me grumpy. And what’s the fun in trying to talk with someone in a restaurant when the noise level’s so high you have to shout to be heard? On the more positive side, I like what I hear when the world’s quiet. Wind in the trees. Fish jumping. A baby crying from another apartment. They’re all the sounds of life – and since I figure I’m probably going to have to die at some point, I want to enjoy as much life as possible before I do! Ad Vent is when Christians complain about the commercialization of Christmas. I like the thought of embracing the angel in the room. After all, why would angels make their presence known if they didn’t want to come to the party? Linda, I have learned much from your writing tonight. I do believe in angels. If the notions and belief are true about silence then I am surrounded up on the mountain. I have never lived in a place that was so quiet most of the day long. I look forward to being wrapped in it when we finally move there. An occasional dog barking, a tractor now and again, but mostly silence and wind in the trees. Your musical choices are wonderful, thank you! About that mouse-over – I’d never thought about it before, but I don’t use the WordPress galleries for posting photos. I upload mine to an FTP server, and insert them into my blog by using their URL. There’s an option for either a visible caption or mouse-over. I just experimented, uploading an image into a draft through the image gallery. I chose the custom URL option, and could make the image clickable, but I couldn’t find a way for a mouse-over to work. That’s about the extent of my knowledge on it. I’ve used the gallery only a few times, when I first began the blog. I know they’ve added a multitude of options, but I haven’t paid much attention to them. I suppose I should put that on my 2014 “to-do” list – learn how to insert slide shows, galleries and so on. There it is – my first New Year’s resolution. The silence of the country is one of its best qualities. You’re so lucky to be able to create such a refuge for yourselves. When I used to spend time up at The Place, it was amazing what could be heard on a still day. We could sit there and figure out what was going on for miles, just by the sounds – a chainsaw starting up to the south, dogs baying to the east. If there’d been plenty of rain, the creek would sing, and if it was autumn – well, there were those acorns. I don’t know what it is about that Serbian carol, but I just love it. I’m glad you do, too. A beautiful carol, thank you. I generally shudder as the ‘silly season’ approaches, and hate the musak blasting across the streets with trite songs. Yet I adore some of the other music – one of my favourites being ‘In the bleak midwinter’. I can find myself especially irritated by the commercial enterprises that re-write lovely Christmas songs to push their pizza or perfume or whatever, but I keep the irritation under control by just switching the dial. It’s strange… When I was a kid, there always was music playing downtown when we’d go to shop, or see the lights or the store windows. Of course, the songs usually were something other than “Grandma Got Run Over By a Reindeer”. I also love “In the Bleak Midwinter”. One of the loveliest versions I’ve found online is this one. I haven’t even heard of “An Angel at My Table”. I’ll put it on the watch list for the holiday. I may put it on the watchlist for this weekend if I can find it at the library – it’s cold here, and work’s out of the question today and apparently Monday, so it’s a long weekend. Thanks! On a less elevated note, I well remember Laurence Durrell’s “Alexandria Quartet”. I read it in its entirety over a rather fraught summer in 1969. Whilst the first men were landing on the Moon, I was working as a British Merchant Navy stewardess aboard the RMS “Hebrides” a ferry boat then sailing round the Scottish Islands. The purpose of the job was to raise funds to supplement my upcoming post-graduate course. There were two of us stewardesses – and thirty-nine sailors. So I spent Friday nights firmly locked in my cabin, temporarily safe from sailors looking for Friday night distraction, reading the “Alexandria Quartet”, grateful for the distraction of immersing myself in an exotic world utterly different from the one I was then inhabiting…. I don’t know how much less elevated I’d consider the “AQ”. I think for many of us, it ranks right up there near the top of the heap, certainly as far as literary experiences go and perhaps even beyond that. I’m intrigued as can be by your career on the water. I’m supposing the ferries were used for public transportation – was your job equivalent to that of an airline stewardess? Or were the sailors the “passengers”? Very interesting, in any event. I did some poking around and among other things I surfaced the Flickr page for the Scottish Maritime Museum. I just had a wonderful browse through the photos – but I didn’t see your ferry! I did find the Hebridean Princess and some luxury Hebridean cruises . Oh, my. I wonder if I were really, REALLY good, Santa might bring me one of those? So it was passenger and vehicle transportation, mostly. The sailors were there, supposedly, do do all the hard manual work, navigating etc. I think the good old ‘RMS Hebrides’ was taken out of service some years ago. If I were to tell you some of what used to go on behind the scenes, you might not be so keen on Santa bringing you a cruise…. Clearly, you earned your money. And isn’t it true that the worst experiences often do lead to the best stories? Besides, the story-telling helps us get over the trauma! Your posts are always so wonderfully rich. The subjects of this one would supply the material for at least several evenings of pleasant post-supper talks (punctuated of course by odd silences every 20 minutes or so). Those pauses are sort of a running joke in our family. Years ago our son told us that it has been proven that in any group conversation, every 20 minutes or so this awkward break occurs. I’d never thought about it or been aware of it before. He didn’t say anything about angels passing, the ghost of Abraham Lincoln, the “Harvard pause” or anything of the sort (all of which I’ve just learned from your post). He just told us it happens. And of course after he told us about it, then we began to notice it. Usually when it happens now we just all break out laughing and credit our son Will for being the cause of it. I drilled down into one of the links in that forum discussion and found some studies of these pauses as examples of the “synchronization of pulse-coupled biological oscillators”. Other examples are lightning bugs and crickets. Now that I think about it, those pauses in cricket chirping have been picked up as a common metaphor for conversational pauses. In my hierarchy of preferences, I think I’d put biological causation below angels and Will, but above Harvard and Lincoln. I suppose that suggests I believe in angels but not ghosts – a fairly interesting conversational topic in its own right. I don’t know if you caught it in the comments, but this post was begun in 2008. I’ve still got the email where I mentioned my interest in the phrase “angels passing” to someone. In blogging as in cooking, a long, slow simmer seems to lead to a richer result. What a beautiful Serbian Christmas song ! Thank you Linda. The language itself sounds beautiful too. “Un ange passe” indeed as I read your words, a moment of calm in rather busy day. I found a possible meaning to this expression, at least in French. In a religious boarding school for girls, there was constant chatter between them. When for some reason these young ladies stopped talking, one of the nuns who taught them said “Un ange passe…” as if to say this can only be a “miracle”, only an angel can bring silence in this assembly. There were other meanings but I like this one. It can be an embarrassing moment but it is certainly one that makes you conscious of the value of silence in a busy environment. Very interesting post for this Season. Isn’t it a lovely carol? And they’ve done such a nice job of creating a video which is just slightly mysterious and also beautiful. I’m delighted by your addition to the discussion of “un ange passe”. It makes a good bit of sense. Even if it isn’t the final truth about the genesis of the phrase, I believe I’ll take it as my explanation. I’ve been around chattering, giggling girls of that age, and remember my own school experiences of chatter. I can well understand the Sisters thinking silence among them could only be a miracle. I do think the primary reason I miss heavy snows around Christmastide is because of the increased silence snow brings. It always was magical to see the colored lights reflecting on snow, or go to the city center and see everything transformed.And everyone smiled. I hope your season is filled with silence, but also light and joy! “Speech at best is an honest lie. Silence at worst is a naked verity” – The Book of Mirdad by Mikhail Naimy. Indeed. Thank you for reading, Alan, and for this quotation, which I didn’t know.